A behaviourally based lifestyle physical activity intervention in combination with dietary intervention appears as effective as a structured exercise regimen in promoting physical activity in previously sedentary overweight and obese persons, concomitantly improving their cardiometabolic health profile through a healthier body weight. These findings are encouraging because this approach removes many of the commonly reported barriers to sustained participation in structured exercise training programmes in a group of adults in need of its cardiometabolic health benefits. Overweight and obesity have become so common that they are replacing the more traditional health problems of undernutrition and infectious diseases as significant causes of poor health world wide.3 Excess weight is associated with numerous diseases and conditions including cardiovascular disease, Type 2 diabetes mellitus, hypertension, dyslipidaemia, osteoarthritis, sleep apnoea, gallbladder disease, infertility, and some cancers.5 The direct and indirect costs of obesity are considerable, with the associated expenses representing 7% of the national health care budget in the United States, 7% in the Netherlands, 4% in France, and 2% in Australia.6 Clearly, overnutrition is a serious health hazard world wide with significant financial expense. Our genetic pool has not been altered dramatically over the past 10 years. Consequently, the obesity epidemic can be attributed to environmental factors that promote physical inactivity and excessive intake of calories and high fat energy dense foods leading to a state of chronic positive energy balance.3,7 This long term excess energy availability contributes to insidious cumulative weight gain eventually resulting in overweight and obesity. Ecological studies support the notion that the decline in energy expenditure is the more probable cause of the obesity epidemic than overnutrition per se. In the United Kingdom, the prevalence of obesity increased over 150% between 1980 and 1997, whereas food intake per household decreased by 20% over this same time period.8 These observations support the contention that the significant increase in obesity world wide is due to greater relative declines in physical activity than increases in energy intake. Overweight and obesity have or are likely to become the norm in many societies world wide. A viable public health strategy is to target improving the health of those with excess weight through the beneficial effects of physical activity rather than striving for unrealistic body habitus transformations by significant reductions in energy intake.11 Physical fitness, of which habitual physical activity is a major determinant, confers protection from cardiovascular and all cause mortality in the presence of overweight and obesity.12 Although the primary prevention and reversal of obesity is optimal, these goals may never be achieved in the industrialised world. A more realistic health promotion strategy is to encourage participation of the overweight and obese in lifestyle physical activity that is accumulated throughout the day to achieve healthier body weights.11,13 The purpose of this paper is to present evidence on the important role that lifestyle physical activity has in achieving and maintaining a healthier body weight through its favourable influence on the cardiometabolic risk factor profile in overweight and obese adults. Recently a plethora of literature has been published on the role of physical activity in the treatment of the overweight and obese. The extensive reference lists contained within these documents were scrutinised by the authors for relevant articles to include in this paper on the role of lifestyle physical activity in mediating a healthier body weight in the presence of overall adiposity. These reports included the National Institutes of Health Obesity Education Initiative (OEI),14 in which panel members conducted a systematic Medline review from 1980 to 1997 on keywords relevant to the evidence based model for the treatment of overweight and obesity. Another key resource was the proceedings of the American College of Sports Medicine (ACSM) consensus conference,13 in which the authors expanded the scope of their reviews beyond the OEI in terms of years searched and appropriate keywords. Other reference lists consulted were the World Health Organisation,3 the American Medical Association,4 the Surgeon General Report,15 and the review by Dunn et al16 on the role of lifestyle physical activity in the treatment of obesity. In addition, a Medline search was conducted by the authors from 1997 to the present using various combinations of the major exposure measures discussed within this review. We found the literature on lifestyle physical activity and cardiometabolic health outcomes among overweight and obese adults to be promising but very limited, which is in agreement with others.13,16 Over the course of the year preceding the writing of this review, the authors subscribed to receipt of the current table of contents of scientific journals relevant to this topic. Finally, the authors' personal files accumulated from their pertinent publications were examined,17–19 and experts were consulted for suggestions and recommendations about possible manuscript content. Accumulating scientific evidence indicates that the risk of death from cardiovascular disease and all causes increases throughout the range of overweight (BMI ≥25 kg/m2) and obesity (BMI ≥30 kg/m2) across the adult lifespan.20,21 Calle and coworkers21 reported the BMI range associated with the lowest mortality to be between 22.0 and 23.4 kg/m2 for women and 23.5 and 24.9 kg/m2 for men, whereas Stevens et al20 found the range to be between 19.0 and 21.9 kg/m2 for both genders. It is notable that the incidence of cardiometabolic disease begins to increase at a BMI well below 25 kg/m2.9,10 For these reasons, adults of all ages are recommended to strive for a healthy normal weight consistent with a BMI between 18.5 and 24.9 kg/m2.3 Table 1 shows the World Health Organisation classification scheme for overweight and obesity by BMI with associated disease risk. Given the alarming trend data provided in the introduction, most adults in the United States and other industrialised countries fall outside the desirable BMI range associated with a normal weight. Many obesity related health conditions are ameliorated with relatively small changes in body weight.9–11 As indicated, physical fitness exerts a protective effect even when excess adiposity is present.12 A realistic health promotion treatment strategy for the millions of overweight and obese persons is to strive for a healthier body weight within the confines of an otherwise insidious disease process. An ideal approach to achieve this goal is to increase overall energy expenditure through lifestyle physical activity. The traditional structured exercise prescription for becoming physically fit has failed dismally in motivating most adults to become habitually physically active.15 The fitness oriented exercise prescription advocated participation in 20–60 minutes of continuous aerobic exercise for three to five days a week performed at 60–85% maximal oxygen consumption (V̇o2max), which is equivalent to 70–90% of the maximum age predicted heart rate or 7–10 metabolic energy equivalents (METs).22 Most Americans do not ordinarily exert themselves beyond 30–35% of the V̇o2max!23 In recent years, it has become evident that the quantity of exercise needed for health benefit is considerably less than that needed to achieve physical fitness.15,22 In addition, participation in vigorous activity (>60% V̇o2max) is associated with increased risk of injury and death for irregular exercisers and those with disease,24,25 which are common features of overweight and obese persons. These disclosures have led exercise and behavioural scientists to investigate innovative ways to encourage our predominantly physically inactive society to become less sedentary and more physically active. One encouraging approach in this regard has been the emergence of lifestyle physical activity. Dunn and coauthors16 have defined lifestyle physical activity as the daily accumulation of at least 30 minutes of self selected activities including leisure, occupational, and household activities that are at least moderate in their intensity. These activities may be planned or unplanned, structured or unstructured, and are part of routine tasks of everyday life. For the purposes of this paper, our focus will be on lifestyle physical activities that are of low to moderate intensity, defined as <40–60% of V̇o2max, <55–70% of the age predicted heart rate, or <4–6 METs among middle aged persons 40–64 years of age. This level of exertion seems most appropriate for a population of adults with excess weight who exhibit predominantly sedentary behaviour and who are vulnerable to the adverse effects of vigorous exercise. Overweight and obese persons, especially those with excess abdominal adiposity, are predisposed to a variety of cardiovascular and metabolic diseases and disorders including hyperinsulinaemia, glucose intolerance, dyslipidaemia, and hypertension as well as Type 2 diabetes mellitus and coronary heart disease.3,5,14 The term cardiometabolic disease was formulated to link the disorders of the metabolic syndrome (abdominal adiposity, hypertension, dyslipidaemia, hyperinsulinaemia and glucose intolerance) that are predictive of cardiovascular disease and Type 2 diabetes mellitus.17 Figure 1 presents the interrelated concepts of cardiometabolic disease. A useful clinical measure of abdominal adiposity is the waist circumference. A waist girth greater than 102 cm in men and 88 cm in women is associated with increased cardiometabolic disease risk among adults with a BMI between 25 and 34.9 kg/m2.3,14 Our remaining discussion will focus on the cardiometabolic health merits of physical activity with emphasis placed on a lifestyle approach among overweight and obese adults. In both of these scientific conventions, the interpretative emphasis was placed on evidence category A, randomised clinical trials. The ACSM panel of experts concluded that the existent evidence was too limited to make definitive conclusions on the role of physical activity in the aetiology and treatment of obesity. Nonetheless, they arrived at the following conclusions.13,26 Diet in combination with exercise conferred greater benefit than diet alone in maintaining weight loss. However, the influence of exercise alone on weight loss was modest, with a 1–2 kg reduction over a study duration of typically four to six months (evidence category B). Explanations for these somewhat unexpected findings included small sample sizes, short study durations, poor adherence to exercise prescription, methodological limitations in measurements of body habitus and energy balance, and cross over effects between control and experimental groups in the literature surveyed. Increased physical activity, with or without weight reduction, improves insulin action and reduces insulin resistance in obese persons (evidence category A). Exercise alone or exercise combined with weight loss attenuates the progression from impaired glucose tolerance to Type 2 diabetes mellitus (evidence category C). Endurance exercise training when combined with a weight loss of >4.5 kg improves the lipid lipoprotein profile by raising high density lipoprotein cholesterol and lowering triglycerides among overweight and obese men and women (evidence category A). Dynamic aerobic training, with or without weight loss, reduces blood pressure among the overweight and obese with the greatest effects seen among persons with hypertension (evidence category A). Physical activity, with or without weight reduction, is associated with decreases in visceral and abdominal subcutaneous tissue, but not with decreases in waist circumference (evidence category C), whereas the OEI14 concluded that physical activity modestly reduced abdominal fat among overweight and obese adults (evidence category B). The above statements substantiate the important role that physical activity has in the mediation of a healthier body weight among overweight and obese adults without excessive energy deprivation. The aerobic exercise interventions used in most of the study designs from which these conclusions were drawn involved structured programmes ranging in intensity from moderate to vigorous. Because of a sparsity of data, the ACSM consensus panel did not comment on the cardiometabolic health benefits of lifestyle physical activity among overweight and obese adults. Although limited, there exists a growing body of evidence purporting the cardiometabolic health merits of lifestyle physical activity among overweight and obese adults across the lifespan. These preliminary reports are encouraging in view of the failure of long term adherence (>one year) to structured endurance exercise and hypocaloric diets as strategies to permanently reverse overweight and obesity and its comorbidities. The National Weight Control Registry27 is the largest study of overweight and obese persons successful at long term maintenance of weight loss. Those enrolled lost an average of 30 kg from a mean maximum weight of 100 kg for a duration of 5.6 years by a combination of diet and exercise. It is notable that a unique identifier of the weight loss maintainers was the report of a mean energy expenditure of 11 830 kJ/week. Of this amount, 72% of the energy expended consisted of a mixture of light to moderate intensity physical activities. An essential component of long term weight loss maintenance among obese persons appears to be the expenditure of sizeable amounts of energy through a mixture of structured and unstructured leisure and routine activities of daily living which is consistent with the lifestyle physical activity concept. The favourable association between physical activity and indices of cardiometabolic health are often obscured by the strong confounding influences of visceral and/or overall obesity, especially among older adults, in whom there is a greater accumulation of abdominal to overall adipose tissue compared with younger persons.3,14,18,19 Older adults are more susceptible to the punitive effects of vigorous exercise, whereas walking distances of more than 1.5 mile a day has documented cardioprotective effects in this population.28 The cardiometabolic health benefits of accumulated lifestyle physical activity for older persons seem intuitive but as of yet are understudied. For these reasons, we examined whether the blood glucose lowering effect of daily accumulated movement was modulated by obesity pattern in a large sample of community dwelling older adults (mean (SEM) age 74.0 (0.3) years).19 Our indicator of accumulated daily physical movement typical of the past month was a single question from the Yale Physical Activity Survey.29 The question read, “About how many hours do you spend moving around on your feet while doing things? Please report only the time that you are actually moving.” Investigators assisted respondents by citing examples of activities that involved moving about while doing things that ranged in energy expenditure from 2 to 4 METs. These lifestyle activities included light housekeeping, cooking, doing dishes, grocery shopping, and leisurely walking at the mall. Volunteers (n = 743) were mostly women (79.4%), non-Hispanic white (82.6%), and of lower socioeconomic status, with 58.1% indicating an income at or near the poverty level and 52.8% reporting that they had completed grammar school or less as their highest education level. The total sample was divided into three body habitus patterns: the centrally obese (n = 310), who relatively had a higher BMI (32.7 (0.3) kg/m2) and waist circumference (103.3 (0.5) cm); the overall obese (n = 79), who relatively had a higher BMI ( 30.8 (0.4) kg/m2 ) and lower waist circumference (87.5 (0.4) cm); those of normal weight (n = 354), who relatively had a lower BMI (23.88 (0.1) kg/m2) and waist circumference (80.3 (0.4) cm). As the number of hours a day of moving about increased, waist circumference and blood glucose were reduced among the centrally obese but remained similar among those with overall adiposity and those of normal weight (table 3). In contrast, average blood glucose and waist circumference were not different by category of hours of daily accumulated lower intensity movement in those with overall obesity and those of normal weight. These findings on lifestyle physical activity among older adults with central obesity are in agreement with other reports on young and middle aged overweight and obese persons. These reports, as does ours, support the contention that the favourable cardiometabolic effects of structured exercise training are more related to exercise volume or total energy expenditure than increases in cardiorespiratory physical fitness per se.17,18,23,27 An important public health take home message from this study is that a particularly high risk group (less affluent, sedentary, and viscerally obese older adults) was found to have a healthier cardiometabolic profile merely by moving from the lowest category of daily movement, less than three hours a day, into a higher category of daily movement, more than three hours a day. Although observational in nature (evidence category C), our results suggest that three hours or more of lower intensity daily lifestyle movement are an adequate stimulus for achieving more desirable blood glucose levels and reductions in abdominal adiposity among viscerally obese older adults of lower socioeconomic status. Lipoproteins were not measured in the previous study and may have been favourably influenced by greater amounts of daily accumulated movement. Accordingly, we investigated the influence of lower intensity physical activity on blood lipid lipoproteins in a subsample of 155 community dwelling older adults.30 Volunteers resembled the larger cohort and were mainly white (96.8%), female (65.2%), and on cardiometabolic medications (60.6%), with a mean (SEM) age of 74.2 (0.5) years. After adjustment for medication use, postprandial state, age, gender, and visceral and overall adiposity, greater levels of daily accumulated lifestyle movement were associated with increased high density lipoprotein cholesterol, reduced low density lipoprotein cholesterol, and a lower ratio of total cholesterol to high density lipoprotein (p<0.05). Total cholesterol and triglycerides tended to be decreased with greater amounts of routine daily movement (p = 0.08). Once again, these data concur with the notion that lifestyle physical activity of low to moderate intensity result in cardiometabolic advantages in community dwelling older adults (evidence category C). Dunn and colleagues31 compared the effects of a behaviourally based lifestyle physical activity programme and a structured exercise programme on cardiovascular disease risk factors in sedentary healthy middle aged men (n = 116) and women (n = 119) with a mean BMI of about 28 kg/m2. Participants in both groups received six months of intensive programmatic interventions followed by 18 months of maintenance programming to total 24 months of study enrollment. The 121 men and women randomised to the lifestyle physical activity programme were advised to accumulate at least 30 minutes of planned or unplanned moderate intensity physical activity on most, preferably all, days of the week by performing routine activities of everyday life. They also received cognitive and behavioral strategies to assist with the initiation, adoption, and maintenance of a lifestyle physical activity programme. The other 114 volunteers were randomised to the structured exercise programme and received a traditional aerobic exercise prescription of 50–80% V̇o2max for 20–60 minutes, three to five days a week supplemented by educational awareness strategies. Both groups decreased their body fat and maintained their body weight over the 24 month study period. There were significant and comparable mean decreases in resting blood pressure and increases in V̇o2max in each of the groups (table 4). Favourable blood lipid lipoprotein alterations from baseline were noted in both groups at 24 months but these did not achieve statistical significance in the lifestyle physical activity group. These results support the supposition that a behaviourally based lifestyle physical activity intervention is as effective as a structured exercise regimen in promoting physical activity in previously sedentary overweight persons while simultaneously improving their cardiovascular health profile (evidence category A). Another interesting finding of this study was that both interventions prevented the usual age related weight gain that would have occurred in these middle aged overweight persons over the two year study period.32 These preliminary data suggest that lifestyle physical activity is a realistic public health treatment strategy to attenuate the cardiometabolic disease processes associated with overweight and obesity by possibly stabilising body weight in middle age adulthood. Anderson and colleagues33 examined short (16 week) and long (one year) term changes in weight and cardiovascular risk factors resulting from 16 weeks of dietary intervention combined with either structured vigorous intensity aerobic exercise (n = 20) or moderate intensity lifestyle physical activity (n = 20) in obese (32.9 kg/m2) middle aged (42.9 years) women. All participants were given the same dietary instructions during the 16 week intervention period. Participants in the lifestyle physical activity group received similar guidelines and behavioural support to those outlined in the study by Dunn et al.31 Women in the structured exercise programme attended three step classes a week performing 45 minutes of stepping at vigorous intensity exercise (7–8.5 METs) totalling an energy expenditure of 1884–2093 kJ per workout. After the 16 week intervention programme, all participants met quarterly and were weighed. At these meetings, volunteers were asked to report the percentage of time in weeks that they accumulated more than 30 minutes of moderate intensity exercise (3–5 METs) on at least five days of a given week. Mean weight loss at 16 weeks was significant and similar for both interventions, 7.9 kg for the lifestyle physical activity and 8.3 kg for the structured vigorous intensity exercise group (p<0.001). Triglycerides, total cholesterol, low density lipoprotein cholesterol, high density lipoprotein cholesterol, and resting systolic blood pressure were significantly lower at 16 weeks compared with baseline, whereas V̇o2max were significantly increased in both groups (table 5). When interpreting the long term results, it is important to consider that between the 16 week intervention and study termination (one year) both the lifestyle and structured groups participated in the same programme of behavioral support and moderate intensity lifestyle physical activity. At one year, there was a tendency for more regained weight in the structured exercise group, 1.5 kg, compared with 0.08 kg for the lifestyle group (p = 0.06). All other mean changes were similar between groups at study conclusion. Total cholesterol and resting systolic blood pressure and total cholesterol high density lipoprotein cholesterol ratio were significantly lower and V̇o2max higher at one year than baseline (table 5) (evidence category A). Weiler and coworkers34 recently found a 10 week behaviourally based lifestyle physical activity programme to be effective in increasing physical activity levels and enhancing lipoproteins independently of changes in adiposity and dietary habits in sedentary overweight and obese worksite employees. The preliminary work of Dunn et al31 and Weiler et al34 in overweight and obese middle aged adults and of Andersen et al33 in obese middle aged women indicate that a lifestyle physical activity program is as effective as a traditional more intense exercise programme in producing short and long term cardiometabolic health gains in the absence of substantial weight loss. These results are promising for overweight and obese persons in whom vigorous intensity exercise imposes increased exertional discomfort, orthopaedic and thermal strain, and cardiovascular risk.24,25 Lifestyle physical activities are familiar, enjoyable, convenient, accessible, and time efficient because they may be accumulated throughout the day in smaller time segments within exercise conducive surroundings.15,35 Therefore, lifestyle physical activity removes many of the commonly reported barriers to sustained participation in structured exercise programmes in a group of persons in need of its cardiometabolic health benefits. A provocative investigation, the results of which suggest the merits of lifestyle physical activity in the treatment of overweight and obesity, is that of Levine et al.36 These authors designed a study to identify which component or components of energy expenditure accounted for resistance to fat gain during overfeeding of 4186 kJ/day in excess of weight maintenance requirements for eight weeks. The subjects were 16 non-obese men and women between 25 and 36 years of age. The investigators hypothesised that non-exercise activity thermogenesis, defined as the energy generated by participation in non-volitional exercise such as fidgeting, spontaneous muscle contraction, maintaining posture when not recumbent, and activities of daily living, would be the principal mediator of resistance to fat gain with overfeeding. Indeed, activation of non-exercise activity thermogenesis was found to be predictive of opposition to fat accumulation among study volunteers (evidence category C). These findings are consistent with others presented in this paper showing that efforts to increase lifestyle physical activity will be beneficial in the treatment of the overweight and obese. Although structured in their exercise prescription design, several studies have shown that home based exercise performed in multiple bouts combined with dietary modification are as effective as continuous bout regimens in maintaining long term weight loss and improving cardiometabolic health indicators in overweight middle aged women.37–39 Jakicic and coworkers39 found that women who were successful at maintaining weight loss in their study were those who reported exercising more than three hours a week. Thus it appears that, for overweight and obese people to achieve long term weight loss maintenance, sizeable amounts of accumulated energy expenditure (>10 465 kJ/day) are required. In order to achieve these significant amounts of daily energy expenditure, non-traditional approaches to exercise prescription such as lifestyle physical activity should be considered in a population that is predominantly sedentary and susceptible to the punitive effects of structured vigorous intensity exercise training programmes. An obesity epidemic is spreading throughout the industrialised world, with its negative health effects and sizeable health care expenditures. An obesity conducive environment is the culprit, particularly physical inactivity and overnutrition. Of these two offenders, it is now apparent that declines in physical lifestyle activity have made the major contribution to the worldwide obesity epidemic. A viable public health strategy to impede the progression of the obesity epidemic is therefore to reduce sedentary behaviour by encouraging participation in greater amounts of self selected physical activities that are accumulated throughout the day termed “lifestyle physical activity”. Preliminary evidence indicates that this approach is associated with cardiometabolic health gains even in the absence of sizeable weight loss. Indeed, lifestyle physical activity programmes accumulating energy expenditures that exceed 10 465 kJ/week combined with dietary interventions appear to be as effective as more traditional structured programmes in long term weight loss maintenance and improvements in cardiometabolic health among overweight and obese persons. Although prevention of obesity is the ideal goal, we live in a world in which obesity is rapidly replacing infectious disease and undernutrition as the most serious health threat. At this time it seems prudent to advocate increases in daily energy expenditure through a lifestyle physical activity approach to achieve healthier body weights for the treatment of overweight and obesity. Which of the following parameters is consistent with moderate intensity physical activity for middle aged persons? Cardiometabolic disease is a cluster of which of the following diseases and conditions? 1 (b); 2 (e); 3 (e); 4 (c); 5 (b). Flegal KM. The obesity epidemic in children and adults: current evidence and research issues. Med Sci Sports Exerc1999;31:509–14. Mokad AH, Serdula, MK Dietz WH, et al. The spread of the obesity epidemic in the United States, 1991–1998. JAMA1999;282:1519–22. World Health Organization. Obesity: preventing and managing the global epidemic. Report of a WHO consultation on obesity. Geneva: World Health Organization, 1998. Koplan JP, Dietz WH. Caloric imbalance and public healthy policy. JAMA1999;282:1579–82. Jung RT. Obesity as a disease. Br Med Bull1997;53:307–21. Colditz GA. Economic costs of obesity and inactivity. Med Sci Sports Exerc1999;31:S653–7. Hill JO, Melanson EL. 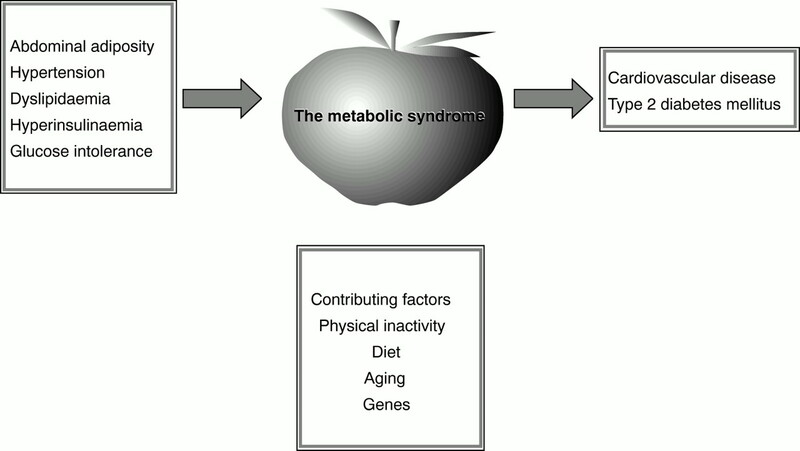 Overview of the determinants of overweight and obesity: current evidence and research issues. Med Sci Sports Exerc1999;31:S515–21. Prentice AM, Jebb SA. Obesity in Britain: gluttony or sloth? BMJ1995;311:437–9. American Heart Association. Call to action: obesity as a major risk factor for coronary heart diesease. Circulation1998;97:2099–100. Willet WC, WH Dietz, Colditz GA. Guidelines for healthy weight. New Engl J Med1999;341:427–34. Gaesser GA. Thinness and weight loss: beneficial or detrimental to longevity? Med Sci Sports Exerc1999;31:1118–28. Wei M, Kampert JB, Barlow CB, et al. Relationship between low cardiorespiratory fitness and mortality in normal-weight, overweight, and obese men. JAMA1999;282:1547–53. Bouchard C, Blair SN. Roundtable introduction. Introductory comments for the consensus on physical activity and obesity. Med Sci Sports Exerc1999;31:S498–501. National Institutes of Health, National Heart, Lung and Blood Institute. Clinical guidelines on the identification, evaluation, and treatment of overweight and obesity in adults: the evidence report. Washington, DC: US Department of Health and Human Services, 1998. US Department of Health and Human Services. Physical Activity and health: a report of the Surgeon General. Atlanta: US Department of Health and Human Services, Centers for Disease Control and Prevention, and National Center for Chronic Disease Prevention and Promotion, 1996. Dunn AL, Andersen RE, Jakicic JM. Lifestyle physical activity interventions: history, short- and long-term effects, and recommendations. Prev Med1998;15:398–412. Pescatello LS. Exercise prescription and management for cardiometabolic health. ACSM's Health & Fitness Journal1999;3:15–21. Pescatello LS. Physical activity recommendations for older adults as they relate to cardiometabolic health: recent findings. Sports Med1999;28:315–23. Pescatello LS , Murphy D. Lower intensity physical activity is advantageous for fat distribution and blood glucose among viscerally obese older adults. Med Sci Sports Exerc1998;30:1408–13. Stevens J, Cai JC, Pamuk ER, et al. The effect of age on the association between body-mass index and mortality. New Engl J Med1998;338:1–7. Calle EE, Thun MJ, Petrelli JM, et al. Body-mass index and mortality in a prospective cohort of U.S. adults. New Engl J Med1999;341:1097–105. Pate RR, Pratt M, Blair SN, et al. Physical activity and public health a recommendation from the centers for disease control and prevention and the American College of Sports Medicine. JAMA1995;273:402–7. Hardman AE. Accumulation of physical activity for health gains: what is the evidence? Br J Sports Med1999;33:87–92. Giri S, Thompson PD, Kiernan FJ, et al. Clinical and angiographic characteristics of exertion-related acute myocardial infarction. JAMA1999;282:1731–6. Shaper AG, Wannamethee G, Walker M. Physical activity, hypertension and risk of heart attack in men without evidence of ischaemic heart disease. J Hum Hypertens1994;8:3–10. Grundy SM, Balckburn G, Higgins M, et al. Consensus statement physical activity in the prevention and treatment of obesity and its comorbidities. Med Sci Sports Exerc1999;31:S502–8. Klem ML, Wing RR, McGuire MT, et al. A descriptive study of individuals successful at long-term maintenance of substantial weight loss. Am J Clin Nutr1997;66:239–46. Hakim AA, Curb JD, Petrovitch H, et al. Effects of walking on coronary heart disease in elderly men: the Honolulu heart program. Circulation1999;100:9–13. DiPietro L, Caspersen CJ, Ostfeld AM, et al. A survey for assessing physical activity among older adults. Med Sci Sports Exerc1993;25:628–42. Costanzo D, Murphy D, Pescatello LS. Daily accumulated physical activity favorably alters lipoproteins among older adults [abstract]. Med Sci Sports Exerc1998;30:S172. Dunn AL, Marcus BH, Kampert JB, et al. Comparison of lifestyle and structured interventions to increase physical activity and cardiorespiratory fitness a randomized trial. JAMA1999;281:327–34. DiPietro L, Kohl HW, Barlow CE, et al. Improvements in cardiorespiratory fitness attenuate age-related weight gain in healthy men and women: the aerobics center longitudinal study. Int J Obes1998;22:55–62. Andersen RE, Wadden TA, Bartlett SJ, et al. Effects of lifestyle activity vs structured aerobic exercise in obese women. JAMA1999;281:335–40. Weiler AM, Faghri PD, Pescatello LS, et al. The effectiveness of a behavior modification lifestyle physical activity program among worksite employees [abstract]. Med Sci Sports Exerc in press. Project PACE Physician Manual. Physician-based assessment and counseling for exercise. Atlanta: Centers for Disease Control, Cardiovascular Health Branch, 1992. Levine JA, Eberhardt NL, Jensen MD. Role of nonexercise activity thermogenesis in resistance to fat gain in humans. Science1999;283:212–14. King AC, Haskell WL, Taylor CB, et al. Group vs home-based exercise training in healthy older men and women: a community-based clinical trial. JAMA1991;266:1535–42. King JM, Winters C, Lang W, et al. Effects of intermittent exercise and use of home exercise equipment on adherence, weight loss, and fitness in overweight women. JAMA1999;282:1554–60. Jakicic JM, Winters C, Lang W, et al. Effects of intermittent exercise and use of home exercise equipment on adherence, weight loss, and fitness in overweight women. JAMA1999;282:1554–60.